Short interest figures for the middle of July were released after the close on Tuesday, so we have just updated our regular report on short interest trends for the market, sectors, and individual stocks for clients. Below we wanted to quickly highlight the stocks with the highest levels of short interest as a percentage of float. 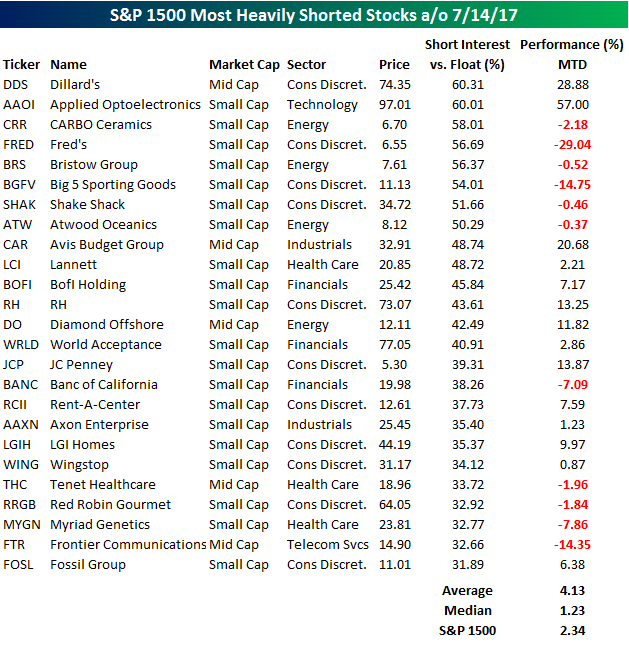 The list below shows the 25 stocks in the S&P 1500 that have the highest short interest as a percentage of float (SIPF). Through early Wednesday, the 25 stocks listed below were up an average of 4.13% (median: 1.23%) compared to a gain of 2.34% for the S&P 1500. For a more detailed look at short interest data on a regular basis, sign up for a monthly Bespoke Premium membership now!